Compact and tough, the Trencher Shovel is ready to tackle the gnarled roots and stubborn rocks you'll encounter while digging a hole. The blade’s edges double as either a saw or machete, perfect for doing some trail maintenance. The nylon sheath has multiple points of attachment, making it easy to pack from A-to-B. 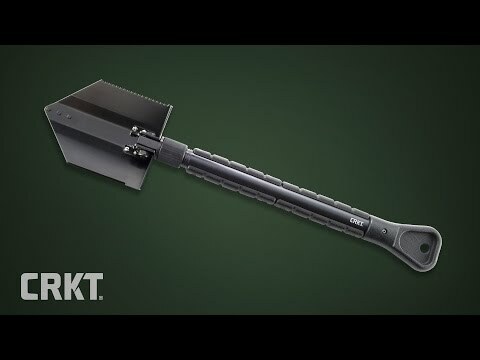 Reinforced shovel tip slides past rocks and cuts through roots and debris. Multi-function shovel blade is sharpened on one side and has saw teeth on the other. Ergonomic handle has textured polypropylene grips over a tough steel core. Threaded blade collar secures the blade, open, closed, or at a right angle, letting you use the trencher like a pick-axe. Included nylon sheath protects you and the tool during transport and storage. Sheath snaps closed and has MOLLE webbing on the back for a range of attachment styles.